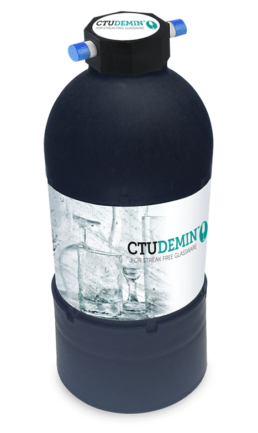 Demineralisation removes TDS (Total Dissolved Solids) from water using an ION exchange process. Complete demineralisation of water can be achieved using mixed bed resin which essential mixes more than one type of ION Exchange resin at the same time. This mixed bed resin contains a strongly acidic resin (Cation) and a strong Alkaline version (Anion). The process of water passing through this resin allows the cations and anions present in the water to be exchanged for H+ and oH-, resulting in H20. Therefore, the demineralised water has very low conductivity due to the lack of cations and anions present in the treated water. In addition, corrosion is negligible, as are scale deposits due to the reduction of silicic acid and free carbon dioxide. Demineralisation is a process by which inorganic salts, often referred to as Total Dissolved Solids (TDS), are removed from source water using a similar ion exchange process to the one found in water softeners. Total demineralisation of water can be obtained by mixing several types of ion exchange resin together – hence the name Mixed Bed. The vessel contains cation resin, which is strongly acidic, and anion resin, which is strongly alkaline. Demin water is excellent for high-end, ‘pure’ water results in medical, laboratory or glass cleaning applications. Our de-mineralisation units remove up to 95% of total dissolved solids – including calcium from the incoming water supply. This produces a high quality water that leaves glasses clean and sparkling straight from the dishwasher or glasswasher. 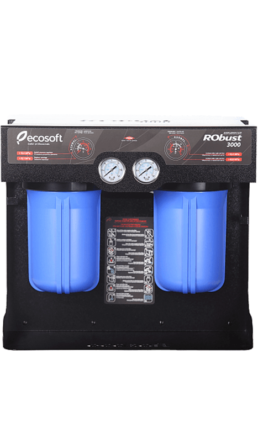 A compact high-capacity reverse osmosis unit for use in a professional kitchen. It produces clean and safe food grade water for commercial kitchen use. Output 145-150 litres per hour. A compact high-capacity reverse osmosis unit for use in a professional kitchen. It produces clean and safe water for water boilers and other uses. Output 75-80 litres per hour.